Hello, hello, it’s POPSICLE WEEK! Billy of Wit and Vinegar is once again hosting this year’s Popsicle Week, a week full of popsicle posts by some pretty awesome bloggers. This is my first year participating, and I couldn’t be more excited! I wanted to create something sweet and delicious, healthy but not straight-up kale popsicle healthy. 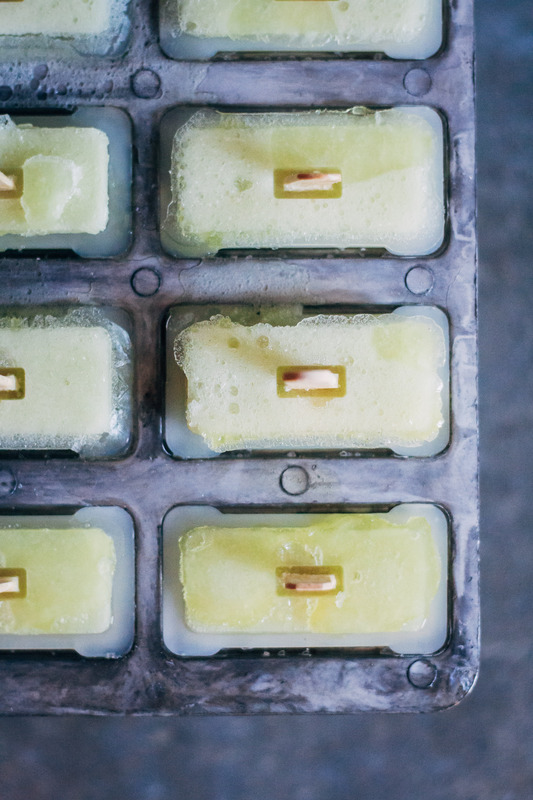 Hence, these green tea and honeydew popsicles were born. They’re just a bit sweet and loaded with antioxidants from the green tea, and are also super refreshing and delicious. I didn’t intend for them to come out dual-colored, but because they don’t contain any sort of binder like xantham gum or other such stuff, they separated into layers. But don’t worry, it’s perfectly natural! Just how fresh juice separates when you let it sit for a while. As a result, the tops taste like honeydew-flavored green tea, and the bottoms taste like green tea-flavored honeydew. It’s actually really good. And it looks pretty striking, don’t you think? But moving on to life stuff. Lately I’ve been really pondering what it means to have a blog. Not just creating recipes / photographing / and writing, but the underlying intentions and motives behind this space. I remember when I first started this space, it was more of a personal endeavor – I posted the things that felt right to me, on a flexible schedule. But now it seems like this is more of a business than a project of passion (as sad as that sounds). I always worry, “Will my readers like this recipe? Is this the type of thing they’re looking for here?”, instead of, “Do I want to do this recipe? Does this food represent me?”. And, of course, I DO want my readers to like my recipes. But I’ve been more concerned with what might seem “popular” that what would actually represent me as a person. But the underlying cause of this dissonance, I think, is that I’ve lost sight of the fact that this is my space. Like an artist, this is my work and my pièce de résistance. I think in the blogging world, it’s easier to get caught up in bloggery (for lack of a better word), than the actual fruits of labor themselves. If any of my fellow bloggers out there know what I mean, hit me up. But seriously. Even though Well + Full has some business-y aspects, this is still my personal space and I want it to remain genuine and natural. I think recipes seem more attractive when they’re personal, you know? When the creator has a personal connection with their creations, that’s where the magic happens. 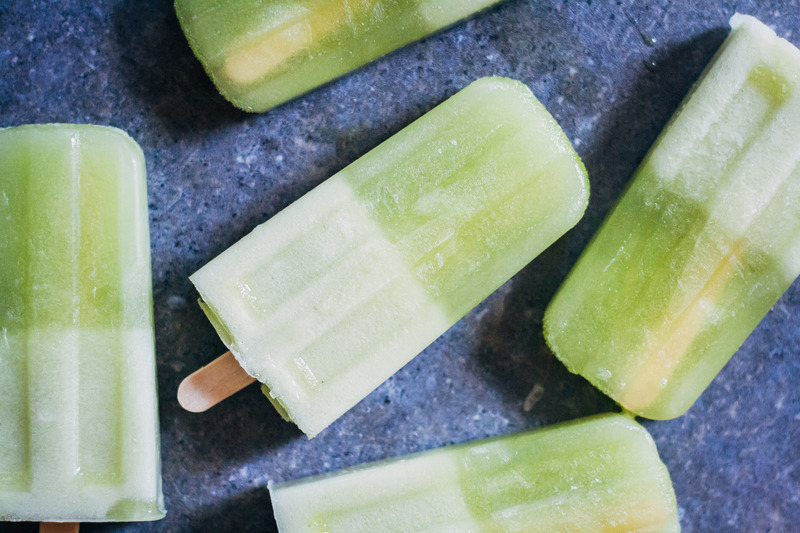 These honeydew green tea popsicles are the perfect refreshing treat for summer! Made will real honeydew and antioxidant-rich green tea. In a blender, combine honeydew and green tea. Blend until everything is smooth and mixed. 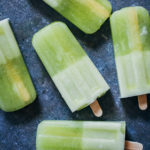 Pour your honeydew green tea mix into your popsicle mold, and set in the freezer for at least four hours or overnight, until popsicles have completely hardened. When you're ready to eat the popsicles, run the molds under a little hot water to loosen, if needed. While freezing, the green tea and honeydew may have separated a little - which is perfectly natural. It'll still taste amazing! If you have any extra popsicle mixture, no worries - it's great as a smoothie!! I love this green color and they way they look with the separate layers! I’m totally with you on the bloggery business too! And I love honeydew! I’ve been craving it so much this summer! Great minds think alike ;) Thanks Rebecca! Totally agree. It is easy to get caught up in current tendencies when you want to “keep the blog alive”. I relate to that in terms of selecting topics to write about, like when I write an article on macarons to get more people excited, when I really wanna write about unknown sandwiches from Uruguay. But it’s all about balance :) Easier said then done, I guess…. Great to see you participate in Wit & Winegar’s popsicle event! Love Billy’s blog. You’re right, it totally is a balance. Have to do a mix of what people want vs. what you want ;) Thanks Fernando! i actually really like the separation (: and yes i agree; i feel like sometimes i blog more for the obsession rather than the joy of it, and i end up feeling lost when i realize i’ve been focusing too much on traffic and money and just things that shouldn’t matter as much. It’s nice to hear I’m not the only one ;) Seriously though. I feel like everyone else’s blog seems so “real” and passionate and mine doesn’t, somehow. So it’s nice to know that other people feel similar things and I’m not alone! I totally know what you mean! Sometimes I feel like my blog isn’t cool enough, or it’s too plain or too complicated or whatever! Then I remind myself that I do this for fun and to express myself and to connect with other people. It’s not always easy, I agree! Btw love these two layered pops! 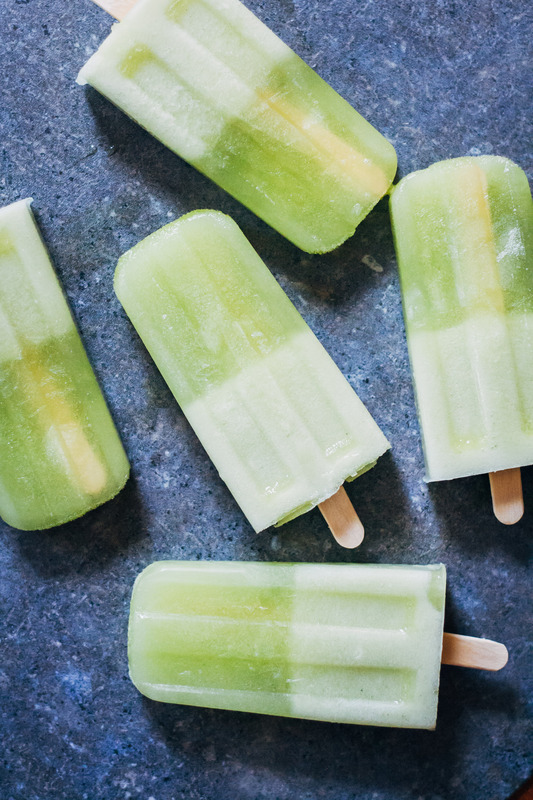 We are riding out a heatwave here in California and these Popsicles are basically all I want right now. The greens look SO refreshing! Love the idea of using honeydew – light and just a little sweet. I so feel you about the bloggery part – mine also started just as a personal endeavor and it has become so much more (not sure if it’s for better or worse), and while I am thankful for all the connections and opportunities it presented, part of me is like… I need to put the brakes on this and really re-identify myself with what my blog is! Thanks for sharing your thoughts with us – I think a lot of bloggers may feel this way but don’t have a forum to share it in! PS – these look absolutely divine. I love the idea of melon with green tea! Also I love what you said about keeping the space yours. I question all the time if I’m writing about the “right” things, but then I just remind myself that I ultimately didn’t start a blog to get eyeballs on it, but for me to have a creative outlet to obsess about food and travel and remember why I love it. I love your photos, btw! Oooh popsicles for breakfast! Such a great idea! ;) Thanks Sarah! I love how easy yet innovativ this recipe is! I feel the same way when it comes to blog! It’s hard to find that balance of you-blog vs them-readers. I enjoy reading your blog a lot! This sure appears to be an issue many, if not most or all, creators of whatever kind, begin to struggle with at some point. And whilst it is an annoying and sad thing, I suppose it’s normal in today’s world, seeing as everything seems to be focused around popularity and success, which obviously, in itself, is nothing bad, as long as it doesn’t begin to challenge one’s morals. Basically, what I’m trying to say is that there is nothing wrong with feeling the way you do and that is is in fact a good thing you are acknowledging this present conflict and trying to solve it. These popsicles look awesome, Sarah! I love that they are two toned – very visually appealing. As for the blog issue, I, too, struggle with what to post – is it good enough – will my readers like it, etc.. Since I don’t have time to post often – I’m lucky if I post twice a month – I feel that I just need to be true to myself and keep my blog as a fun hobby rather than a “business”. Also, the social media aspect of blogging adds another dimension of pressure as well. But I think readers ultimate keep coming back because the want to see what YOU come up with next. They look epic! Love the colours and how they have mixed together! And what a great combo for summer days! These popsicles look dreamy beyond belief! I love the honeydew. I totally understand how you feel by the way! We all struggle with the popular vs personal dilemma. I’ve kind of come to a truce with myself to share what I would like to see on other blogs, in that particular season (summer) and it’s been working so far!! That’s a great compromise, Jessica! I feel really inspired by that manner of thinking… I might try it out on my own blog! :D Thanks, girl! Some truly delicious looking popsicles! These are definitely how I’d like to stay cool this summer! Lovely green popsicle. Great recipe idea for this summer. Pinning. Love your thoughts about blogging. They pop up from time to time for me too, but I mostly just resort to the fact I love it and couldn’t imagine not doing it! That’s such a good point, Erin – I couldn’t imagine not doing this either :) Thanks girl! You can definitely start to think of blogging like that, and it can get less fun and feel more like a chore. Especially if you’re really trying to expand your business and brand. 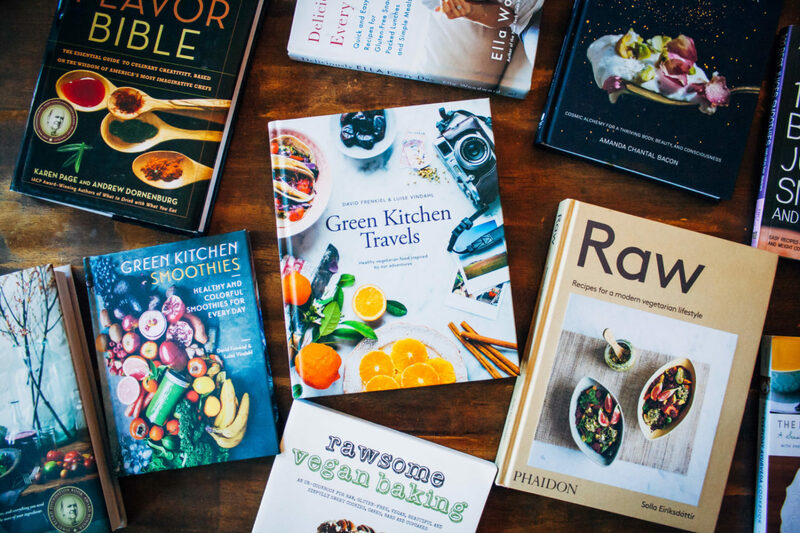 I always just stop and remember why I started – to share good food and express my creativity. Oh, and love the flavors of these popsicles! You’re absolutely right – you have to remember why you started. My reasons are pretty similar to yours :) Thanks Emilie! Aww thanks Sophie! Your support means so much to me, I think your blog is so beautiful and you’re such an inspiration to me! <3 Hope you have a great week too! These look and sound so refreshing! I’ll definitely be trying these out on the hot summer days we have ahead of us! Awesome!! I hope you like them! :D Thanks Sasha!! Yup, That sure IS where the magic happens. It’s crystal clear that’s for sure but even crystals get cloudy sometimes and we need to take good care of them to fully see. I celebrate you for being You. Keep that up, girl! . I think I need to run out and buy popsicle molds so I can make this recipe! These look beautiful and delicious. 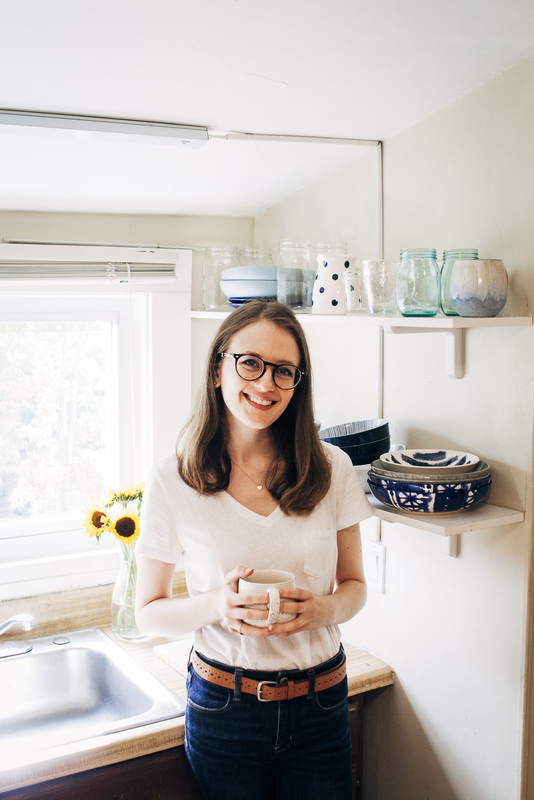 And I so feel you on the blog front – it started as a hobby that I loved, but some days it feels more like a slog that I have to get through. I think for me it’s about a balance of work/life/blog, and once I fine tune that I’ll be happier about all of it.